As is the case with many beer geeks nowadays, my craving for the intense aromas, flavors, and bitterness of hops often directs me to picking up some of Stone Brewing Company’s (Escondido, CA) year round beers. 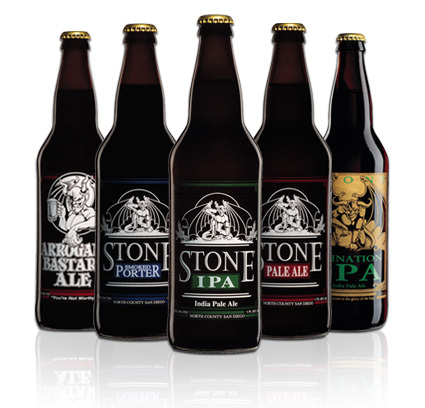 Therefore, before reviewing some of their seasonal beers I contacted Sabrina LoPiccolo, a public relations specialist at Stone to request a bottle of three different hop forward year round Stone beers to review on The Brewed Palate. 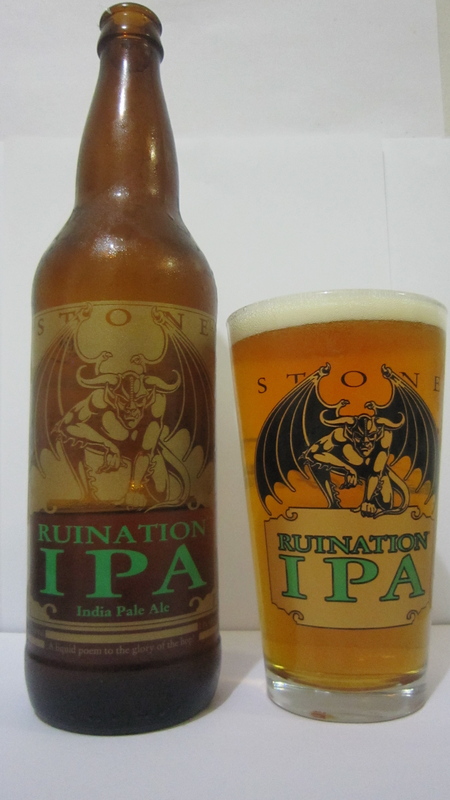 The first beer that I chose to review was Stone Ruination, a west coast style double IPA which clocks in at 7.7% ABV. Having enjoyed its assertive hop character many times in the past, I was eager to pour the beer into the Ruination IPA pint glass that Sabrina sent along with the three beers and dig in. The beer poured a light golden color with one finger of off-white head, which left a considerable amount of lacing on my glass. Next, after admiring its appearance I brought the glass closer to my nose in order take a good whiff of the notes of juicy grapefruit, lemon rind, pine, and bready malt. All of which let me know that the beer was fresh and hoppy. I should note that as I drank my way through the 22oz bottle I picked up some floral hop notes in the aroma as well. The tantalizing hop aromas followed themselves into the taste where my palate was met with big notes of ripe grapefruit upfront. At mid palate I picked up hints of tropical fruit and sweet orange. Then upon swallowing the orange hop notes lingered and were joined by a bready malt backbone and what I at the time described as a bit of floral and earthy hop character. The next beer caught me off guard when I took it out of the box that it came in. 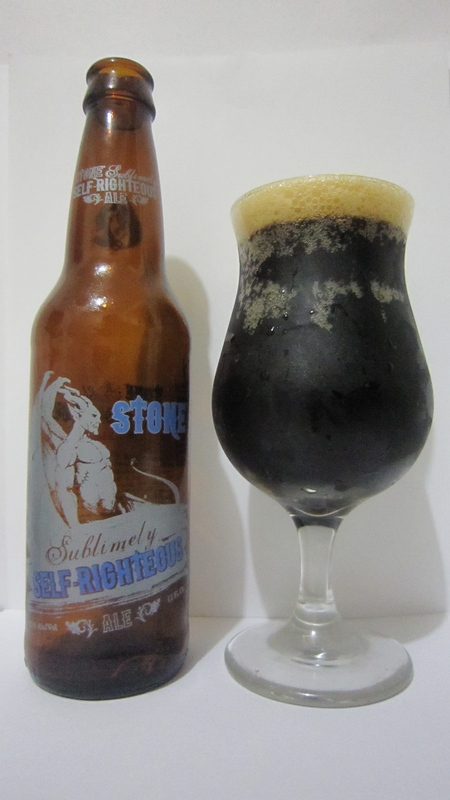 Meaning, before I received it I did not know that Stone’s Sublimely Self Righteous Ale, one of my go to Black IPAs was available in 12oz bottles. Being that it is 8.7% I chose to drink this beer as a night cap and to savor it for as long as possible in order to fully appreciate its complex flavor profile. Upon opening the bottle and pouring it into a tulip glass I could already smell the beers amazing aroma, but paused for a minute to look at its dark brown to black body and one finger khaki head (dissipated quickly, but left an admirable amount of lacing). It also poured with a nice amount of carbonation, which helped draw the inviting aromas upward. SSRA’s aroma consisted of big notes of grapefruit, apricot, coffee, and cocoa, which were accompanied by a bit of pine. While I didn’t recall this beer having such big coffee character from the darker malts I enjoyed this component as it intensified as I enjoyed the beer. As with the Ruination IPA the intense aromatics followed seamlessly in the beer’s flavor profile. Meaning, the citrusy hops blended amazingly with the coffee and chocolate malt flavors. In my tasting notes which I wrote as I drank this beer I remarked that the coffee flavor reminded me of fresh brewed iced coffee. However, interestingly enough as the beer warmed up its flavor profile went back to tasting like I remember this beer tasting in the past. At mid palate the coffee flavor and some chocolate joined with ripe apricot and orange, which made for a quite enjoyable and smooth finish. Completing the taste of this beer were notes of roasty dark malt and sweet citrus, and a touch of dank grapefruit (became apparent just as the beer’s bitterness is faded), which lingered on my palate after each sip. Lastly, Sublimely Self Righteous Ale had a moderate amount of bitterness, was medium bodied, and had the right amount of carbonation for both its style and alcohol content. 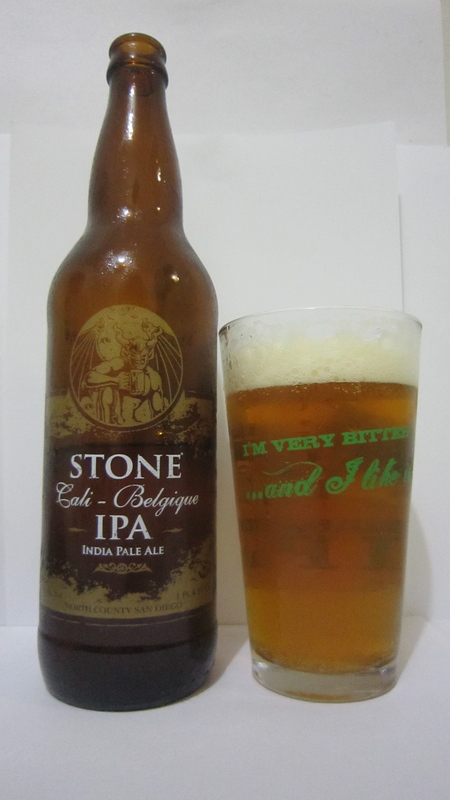 After enjoying the blend of dark malts and fresh american hops it was time to review Stone Cali Belgique IPA, a blend between American hops and Belgian yeast. As shown in the picture I took after pouring the beer into my Ruination IPA pint glass, the beer – poured golden-orange in color with a small, off white, bubbly head. The aroma brought the blend of American and Belgian ingredients to life with herbal and spicy notes from the yeast and grapefruit and floral notes from the hops. In addition, I detected some sweet bready malt, which to me indicated that the flavor profile of this beer would be balanced and not overly bitter. As I drank the beer the balance of characteristics began to teeter in that the belgian yeast at times dominated the beer’s flavor profile and was followed by floral and piney hop flavors rather than the citrus fruits I detected in the aroma. I should mention that as the beer warmed up the fruity flavors that were present in the aroma were at times apparent, but never became as strong as I hoped they would be. Cali Belgique finished crisp with a dry some somewhat sharp bitterness, and was light to medium bodied (leaned more towards medium as I finished the 22oz bottle). This entry was posted in Beer Reviews and tagged Black IPA, Cali-Belgique, craft beer, Escondido, Greg Koch, hops, india pale ale, IPA, San Diego beer, Stone Brewing Company, Stone Ruination, Sublimely Self Righteous Ale, The Brewed Palate. Bookmark the permalink.